The Global Volcanism Program has no activity reports for Sahand. The Global Volcanism Program has no Weekly Reports available for Sahand. The Global Volcanism Program has no Bulletin Reports available for Sahand. Sahand volcano (Kuh-e-Sahand) is located in NW Iran, about 60 km E of Lake Urmia and 40 km SSE of the city of Tabriz. The massive, extensively eroded calc-alkaline stratovolcano is one of the highest peaks in the Azarbaijan region. Numerous lava domes dot its lower flanks. Pleistocene Potassium-Argon dates from 1.2-0.8 million years ago have been obtained (Innocenti et al., 1982), but Karakhanian et al. (2002) stated that eruptions continued into the Holocene. Innocenti F, Manetti P, Mazzuoli R, Pasquare G, Villari L, 1982. Anatolia and north-western Iran. In: Thorpe R S (ed) Andesites, New York: John Wiley, p 327-349. Karakhanian A, Djrbashian R, Trifonov V, Philip H, Arakelian S, Avagian A, 2002. Holocene-historical volcanism and active faults as natural risk factors for Armenia and adjacent countries. J. Volcanol. Geotherm. Res., 113: 319-344. The Global Volcanism Program is not aware of any Holocene eruptions from Sahand. If this volcano has had large eruptions (VEI >= 4) prior to 10,000 years ago, information might be found on the Sahand page in the LaMEVE (Large Magnitude Explosive Volcanic Eruptions) database, a part of the Volcano Global Risk Identification and Analysis Project (VOGRIPA). There is no Deformation History data available for Sahand. There is no Emissions History data available for Sahand. Sahand volcano (Kuh-e-Sahand) is located in NW Iran, about 60 km east of Lake Urmia and 40 km SSE of the city of Tabriz. The city of Maragheh (darker area at lower left) lies below the southern flanks of the volcano. Numerous lava domes (upper right) occupy the lower flanks of the volcano. 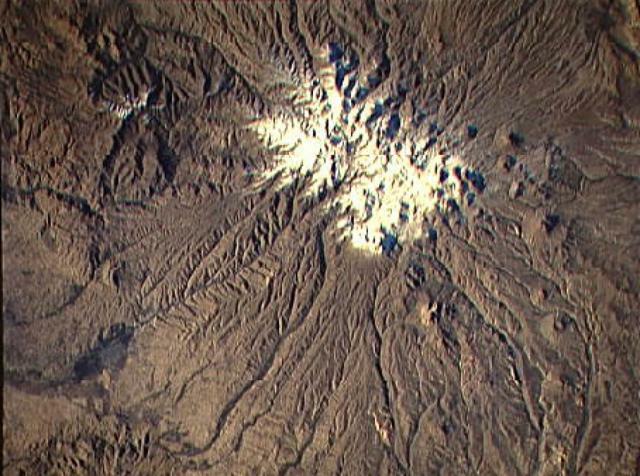 The massive calc-alkaline stratovolcano is one of the highest peaks in the Azarbaijan region and reaches a height of 3707 m.
NASA Space Shuttle image STS74-708-25, 1995 (http://eol.jsc.nasa.gov/). There are no samples for Sahand in the Smithsonian's NMNH Department of Mineral Sciences Rock and Ore collection. Large Eruptions of Sahand Information about large Quaternary eruptions (VEI >= 4) is cataloged in the Large Magnitude Explosive Volcanic Eruptions (LaMEVE) database of the Volcano Global Risk Identification and Analysis Project (VOGRIPA).